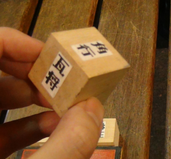 Nana Shogi (ナノ将棋) or drawf-sized Shogi is a variant of Shogi designed by Finnish Shogi master Georg Dunkel, who refers to it as the "World's Smallest Shogi Variant". 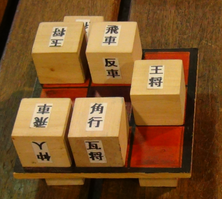 There exists smaller variants of Gufuu and Bushi shogi, but they incorporate rules considerably different than that of Nana and other traditional variants of shogi, such as rotating pieces, shared pieces, and unconventional rules for delivering checkmate. 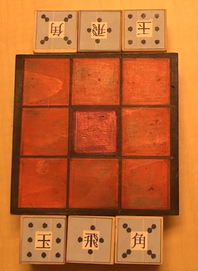 Promotion is shown physically by rotating the cube pieces forward by 90 degrees, and promotion is mandatory after the move of each piece, including capturing moves. 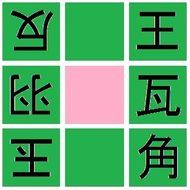 As with most other variants of Shogi, the pieces are of neutral color and ownership is shown by the orientation of the pieces, with the pieces facing toward ones' opponent. Excluding kings, each Nanashogi piece has four promotion states, and promotion (mandatory after each move) is effected by rotating the piece forward 90 degrees. Pieces may be dropped onto the board in any of four promotion states, subject to some restrictions. 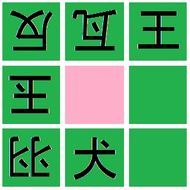 As in Western Chess and Shogi, the king moves one square in any orthogonal or diagonal direction, and does not promote. The rook can move one square in any of the four orthogonal direction, and promotes to a chariot (see below). Note: in the original variant of Nana Shogi, the rook had unlimited range, but the creator of the game deemed this piece too powerful for the small board. The chariot can move any number of free squares in the two vertical directions, and promotes to a swallow's wing (see below). The swallow's wing can move one square orthogonally sideways, and promotes to a go-between (see below). 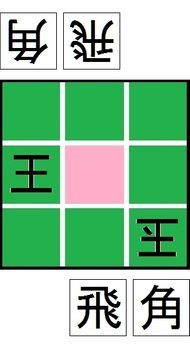 Note: in the original variant of Gufuu Shogi, the swallow's wing moved had unlimited range sideways and could move one space vertically, but the author deemed this piece too powerful. The go between can move one space in a horizontal direction, and promotes to a rook (see above). The bishop can move any number of free squares along any of the four diagonal directions, and promotes to a tile general (see below). The tile general can move one space diagonally forward or one space orthogonally backward, and promotes to a cat sword (see below). The cat sword can move one space in one of the four diagonal directions, and promotes to a dog (see below). The dog can move one space directly forward or diagonally backward, and promotes to a bishop (see above). The game starts with player holding one of each piece in hand: a king, a rook, and a bishop. On their first moves, black and white (in that order) drops their king on the board to any space other than the center. 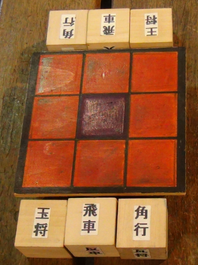 Nana Shogi is played on a 3x3 board with six pieces, initially held in reserve. The player starts by dropping their kings. The central square is shaded a different color as there are special rules regarding moves to that space. Black opens by dropping his king on any of the eight outer squares. White drops his king. Like with other variants of Shogi, it is illegal to move into check. Thus, if black opens by dropping his king onto a corner space, there will be five squares available for white to drop his king. The game then proceeds with regular moves and drops. On a player's turn, he may either move a piece on the board, move a piece on the board with capture, or drop a piece held in hand. As with most traditional variants of shogi, all pieces capture in the same way as they move, and capture by displacement of the captured opponent piece. 1. It is illegal to drop a piece to give check, checkmate, or stalemate. 2. It is illegal to give checkmate or stalemate if, at the beginning of your move, you have pieces in hand. It is, however, permissible to give checkmate or stalemate by a capturing move if your hand starts empty. 3. It is illegal to drop a piece in the center square of the board. 4. Presumably, if your only possibility of escaping check involves giving an illegal checkmate or stalemate, this counts as a loss of the game. Without this rule, this game is ill-defined in some cases, as checkmate is defined by having no legal moves itself. This is not stated by Georg Dunkel, but the problem arose while I was attempting to solve the game, and this rectification affects relatively few positions and seems logical. Please comment if you see another solution. As with most variants of Shogi, the game is won by checkmate or stalemating the opponents' king. White (sitting in the far edge) has been checkmated. In the initial proposal of the game, Georg Dunkel designed the rook and swallow's wing to move in the same way they do in Shogi and Whale Shogi, respectively: the rook moving an unlimited number of free spaces orthogonally, and the swallow's wing an unlimited number of free spaces horizontally or one space vertically. Dunkel played this variation with viewers of his officially site, and it quickly became apparent that this made the piece containing the rook and swallow's wing too powerful, and gave black a major advantage being the first player to drop this piece onto the board. In fact, my research shows that black may win in the original variation in sixteen moves of each side (31 plies), but that a perfect game under the current variation is a draw. The best first move for black in the original variation is to drop his king on the center column of his far row. Dropping his king in either corner allows white to force a draw, while dropping his king on the center column of his front row or in the center row delays winning by two and six moves respectively. Under the original version of Nana Shogi, Black (sitting at the lower edge of the board), may force a win in 53 moves (105 plies) from this position, the longest theoretical win. Under the revised version of Nana Shogi, Black (sitting at the lower edge of the board) may force a win in 68 moves (135 plies) from this position, the longest theoretical win. Black to move and mate in 45. Despite the small size of Nana Shogi, such positions are comparable in complexity to some of the more complex endgames of Western Chess. Note: computer plays both games perfectly. Play at your own risk.